Navajo Nation presidential language requirement: Candidate disqualified. 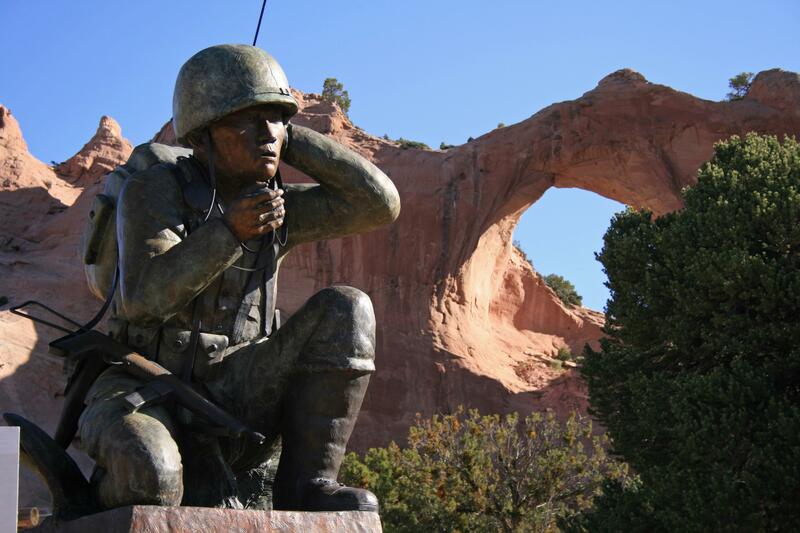 The Code Talkers monument in Window Rock, the seat of Navajo Nation government. In a 2-to-1 vote, the Navajo Nation Supreme Court ordered Deschene off the ballot last week. Then the Navajo Nation Council voted to change the language requirement in an 11-to-10 vote, retroactively, so that Deschene could continue running. On Tuesday, that legislation was vetoed by current Navajo Nation president Ben Shelly. Last month, the tribal Supreme Court upheld the language requirement, saying it was crucial to maintaining Navajo culture, and ordered Mr. Deschene to take a fluency test. He refused, saying he was proficient in the language and objecting that the test had never been used before and was illegitimate. Tribal officials then disqualified him from the race, and the court on Thursday ordered him removed from the ballot and replaced with the candidate who finished third in the primary. In another twist of the crisis, NPR reports, the Nation’s election commissioner has refused to actually reissue new ballots without Deschene’s name—and early voting has already begun. Developing!